I will be flying to Colorado tomorrow morning to attend the funeral for Tim’s mother, which is scheduled for Friday. It will be so good to see Tim, as well as the rest of the family. I’ve been keeping busy in Austin, not with touring, but with errands and projects. Fun things like getting our batteries tested and having the 30,000 mile service performed on the RV. I even got my hair cut! It’s also been fun spending time with Pat and Rich, the couple who will be taking care of Kitty while I’m away. They invited me for a delicious dinner, and I have really enjoyed their company. I can’t express how grateful I am for their kindness and generosity. Tim and I will be back to Austin on Saturday evening and look forward to seeing the city and getting back on the road. Tim’s mother passed away this morning. She died peacefully. Arrangements have not yet been made, but the funeral most likely will take place near the end of this coming week. I’m so thankful that Tim could spend these last few days with his mother and siblings. I will be flying to Colorado sometime this week to join them. My deepest condolences go out to the family. Several weeks ago I began the first in a series of posts about some of the solutions we’ve come up with to make our lives easier and our space in the RV more efficient. While I’m hanging out in Austin, I’ll try to post a few more ideas. Making the RV cat-friendly was one of the first issues we addressed. Kitty is the reason we bought the RV, fondly known as the Kat Karrier, in the first place. Therefore, we knew we would have to figure out a way to accommodate her needs. The first thing that comes to mind is where to put the litter box. Luckily, we have a “basement” in our RV under the sofa, and that is the perfect location for that necessary fact of life. You may remember that it was the basement that led us to purchase this particular RV in the first place. The basement is really just a recessed storage compartment with a removable lid. There is plenty of room inside for a litter box, with space left over for some of our items. The compartment came with a lid that just lifts out. We had a new lid made with a large opening and covered the top with a rubberized mat. Now Kitty can walk under the sofa and jump down into the litter box. The mat then cleans any excess litter from her paws when she exits. That keeps the RV clean. Kitty was used to jumping down through an opening into a litter box at home, so she instantly adapted to this arrangement. We clean the box twice a day, and honestly have never had an issue with odor. The only objectionable odor we have to deal with is her food! Why does canned cat food smell so disgusting? To contain her food, we found a feeding system known as a Neater Feeder. It’s a brilliant invention and is ideally suited for RV travel. The Neater Feeder contains two bowls and catches and contains any spilled food or water. We placed it out of the way between the ottoman and the sofa and secured it so it would not move. I am happy to report that we have never had to clean up any spills on the floor, no matter how bumpy the roads have been. One of the biggest issues we have had to face is what to do with Kitty while we are driving. Although it is recommended that cats remain in a carrier while the vehicle is in motion, many people ignore that rule. We knew that Kitty would not be happy in a carrier so we experimented with letting her have her freedom. We came up with a relatively safe solution that is working perfectly for her and for us. We had purchased a Sleepypod to use as both a bed and a carrier. The bottom half is the bed, and it is very deep with stiff sides and a rubberized bottom. The top half zips on and turns the pod into a cat carrier. We placed the bed portion of the pod on a rubberized mat on the counter next to the sliding door. The pod has never moved an inch while on the road. Kitty hops into the pod when we start the engine, and that is where she spends most of her time. In the afternoon, however, she sometimes gets a bit cranky, just like a child, and decides that my lap is the better place to be. Luckily, she has never tried to get under the driver’s feet. The Sleepypod is Kitty’s bed and safe space, but it’s also where she sits to look out the window, both on the road and in the campground. Kitty also has a small pillow-type bed which goes on the driver’s seat once we arrive at our campsite. That’s often where she will spend the night. Two beds in a small RV! Not to mention our bed, where you will sometimes find her! What a lucky kitty! In order to preserve our upholstery and curtains, we knew Kitty would need her own scratching post. But where could we put one? We came up with a surprisingly simple solution by covering the two posts that support our tables with carpet. We found a texture that she likes, and she started using the posts almost immediately. At least one of the table leg posts is always up and available for her use. She occasionally will try and scratch the curtains or blinds, but thank goodness that’s not too often. You’ve no doubt seen many photos of Kitty in her harness and on her leash. That has worked out surprisingly well, and she loves being able to go outdoors and explore new spaces. We also have a collapsible kitty enclosure that we can install outdoors for her to stay in. We haven’t set it up too many times, but may start using it again when we are able to sit outside in the evenings. Kitty seems to be happy with her space and her things, and Tim and I are so relieved that she considers the RV to be her home. Yesterday afternoon as we were leaving the state park, Tim and I received some devastating news. Tim’s sister Chris called to let us know that their mother would likely not live more than a few days. Although their mother had been confined to a nursing home for the last few years, the news was nevertheless unexpected. My heart goes out to Tim and the family. We were then faced with a decision. What should we do now? I wanted Tim to fly to Colorado so he could say his good-byes to his mother. His mother and sister live in Fort Morgan, which is just an hour north of Denver. The airports in Houston were not too far away so we headed in that direction and made plans in the car. I found a non-stop flight that left Houston Hobby at 6:55 pm, which gave us ample time to get to the airport. We realized, however, that I would not be able to fly to Colorado with Tim. We still had the RV and the cat to deal with, and not enough time to figure out those logistics. Tim was able to get on the flight, and he arrived in Fort Morgan at midnight and was able to see his mother and his siblings. What a long and emotional day he had. We had decided that I would head to Austin, where we had planned to be next weekend and wait to see what would happen. I would plan to fly to the funeral from there. Although we had briefly discussed the possibility of my driving to Colorado, the likelihood of having to drive in snow ruled that out. I left Houston this morning after negotiating a traffic jam caused by horses, riders and wagons, making their way to the Houston Livestock Show and Rodeo. That was a bit unexpected, but fun to see. I was fully prepared to negotiate Houston’s horrible traffic, just not the equine variety. I guess we are back in cowboy country. Is This a Typical Houston Traffic Jam? Nobody Would Have Believed This! I don’t remember much of what I saw along the drive today, but a sign for kolaches at Weikel’s Bakery did make me pull off the highway. I needed a break, so I stopped and bought a few to take with me. What are kolaches, you might ask? Kolaches are a Czech pastry found throughout Central Texas. They are similar to a Danish pastry, but thicker, softer and sweeter. The center is filled with anything from traditional poppy seed to cream cheese, fruits and chocolate. Which Kolache Should I Have First? I arrived at McKinney Falls State Park in Austin this afternoon. That Texas State Park pass is already coming in handy. I’ll be here for a few days awaiting news from Tim. In the meantime, I found a wonderful couple who has agreed to look after Kitty while I’m away. That’s a relief, since I really didn’t want to board her unless absolutely necessary. It’s really strange being here without Tim, although I’m perfectly fine, and so is Kitty. It’s just that Tim and I have been together twenty-four hours a day, seven days a week for the last four months. There’s a big void now that he’s not here. I do miss him. 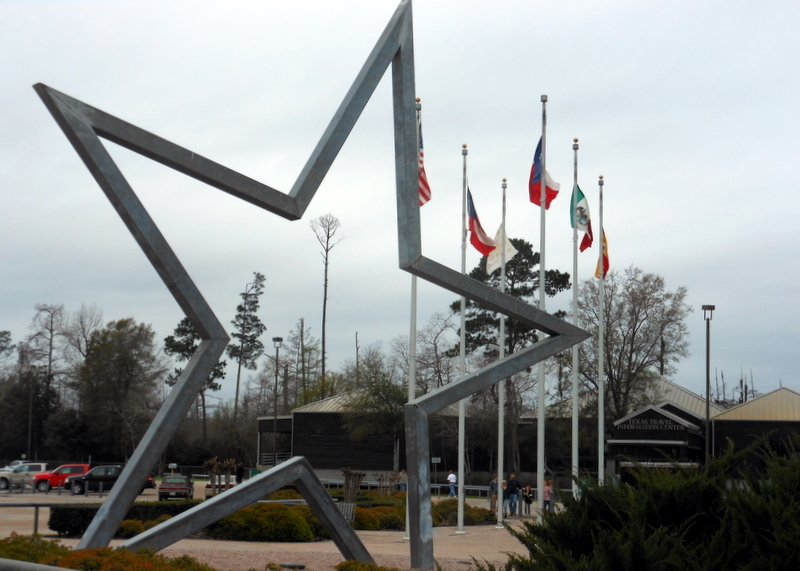 East Texas is an area that is often referred to as the Piney Woods. It’s not at all what I envisioned when I pictured Texas in my mind. Instead of wide-open spaces, there are thousands of acres of pine and hardwood forests. The crown jewel has to be Big Thicket National Preserve. Big Thicket was the first national preserve ever established by Congress. The preserve was created to halt the widespread exploitation of the native pine and cypress. The park is a small remnant of the original, but is an amazing place nonetheless. We explored several of the ecosystems on a hike and were able to see how small changes in elevation, soil and slope can affect plant communities. We also witnessed the effects of the recent rains, and we had to cut short the hike because the trail ended in waist-high water. Except for the mosquitos, it was nice to walk in the woods. What Am I Supposed To Do Now? Swim? Can You Spot the Two Little Critters That Blend Into the Log? Would the Church Really Have Been Located So Close To the Railroad Depot? Just a few miles east of Woodville is Martin Dies, Jr., State Park, and that is where we ended our day. We had heard very good things about the Texas State Park system and wanted to check out a park for ourselves. This one did not disappoint. We are at a campsite with hookups directly on B. A. Steinhagen Reservoir. It’s a beautiful, peaceful place, and there are few other campers here. We even purchased a Texas State Park pass since I think we’ll be staying at quite a few parks while we’re in Texas. Tim and I took advantage of our unplanned weekend in Lafayette, Louisiana, by relaxing, doing a few errands and continuing our exploration of Jean Lafitte National Historical Park and Preserve. 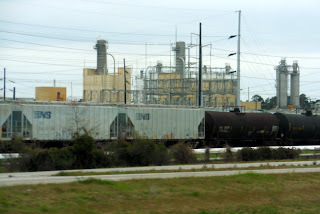 One of the park’s six sites happens to be in Lafayette. Located along the Vermillion River, the Acadian Cultural Center interprets the history, customs and language of the Acadians who settled Louisiana. After watching a rather heavy-handed movie about the history of the Acadians and their exile from Nova Scotia, we spent a bit of time talking with the ranger on duty. She was a delight, and we had a wonderful conversation about theories of interpretation and ways to engage diverse audiences. I hope she is able to implement some of the ideas that she has developed. We really have met some of the most enthusiastic, knowledgeable and dedicated rangers at parks throughout the country. I’m convinced that the National Park Service has some of the best employees of any government agency, or any private company for that matter. Some of our best conversations on this trip have been with these people. This morning we detoured south from Lafayette to Abbeville, Louisiana, to check out the town that figured prominently in the project that brought me to Rocky Mountain National Park in the first place. That project involved preparing a nomination to the National Register of Historic Places for a barn on the west side of the park. The barn was built in 1942 by Frank Godchaux, Jr., who lived in Abbeville. Talk about a small world. I never thought I would visit the area that influenced the design of that historic barn. 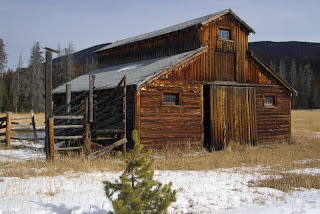 The barn in Rocky Mountain National Park is a local adaptation of the Cajun barns that are found almost exclusively in southern Louisiana. 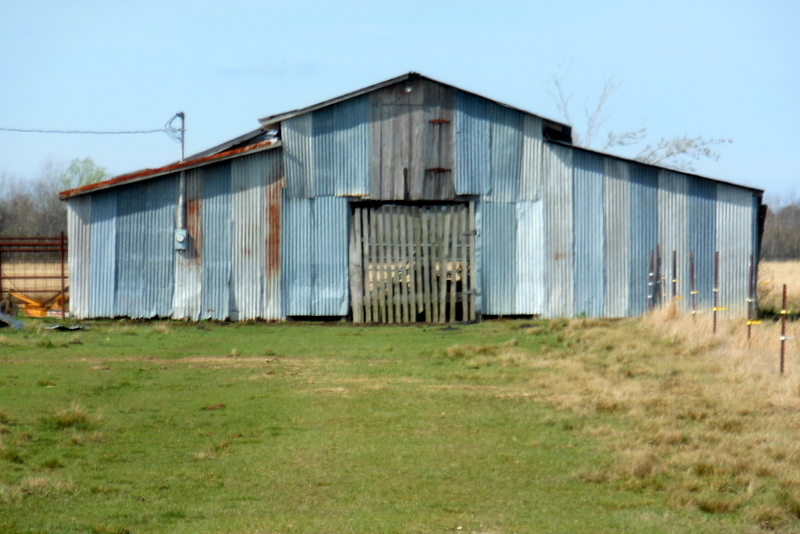 Frank Godchaux sketched a barn that was familiar to him, and we wanted to see if we could find any barns around Abbeville that might have influenced the design. 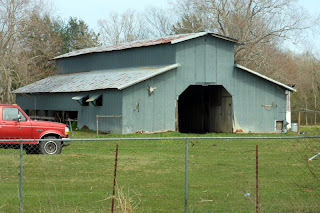 We really didn’t find much, since we didn’t take the time to drive many of the back roads, but we saw a few barns with somewhat similar characteristics. This certainly was far from a professional survey, just a fun “look-see.” Even though we came up short, we had a good time looking more closely at the buildings in the landscape. 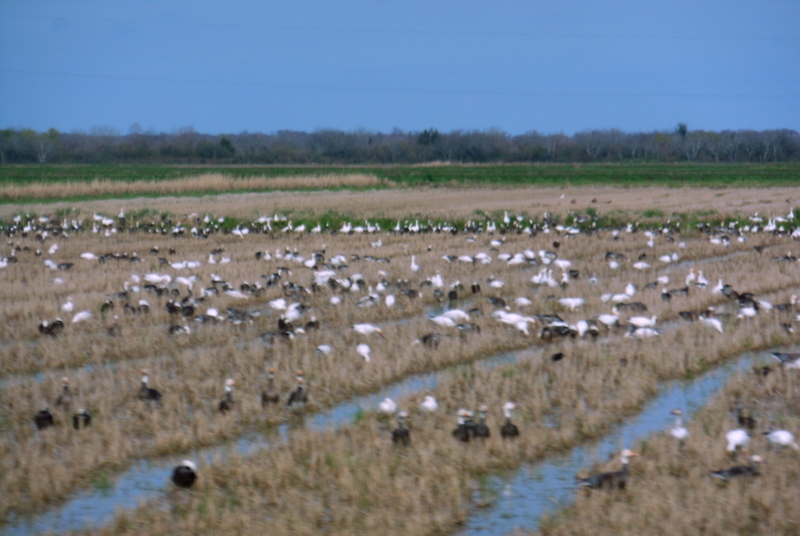 We continued our drive through southern Louisiana and passed hundreds of rice fields that happened to be flooded from the recent rains. 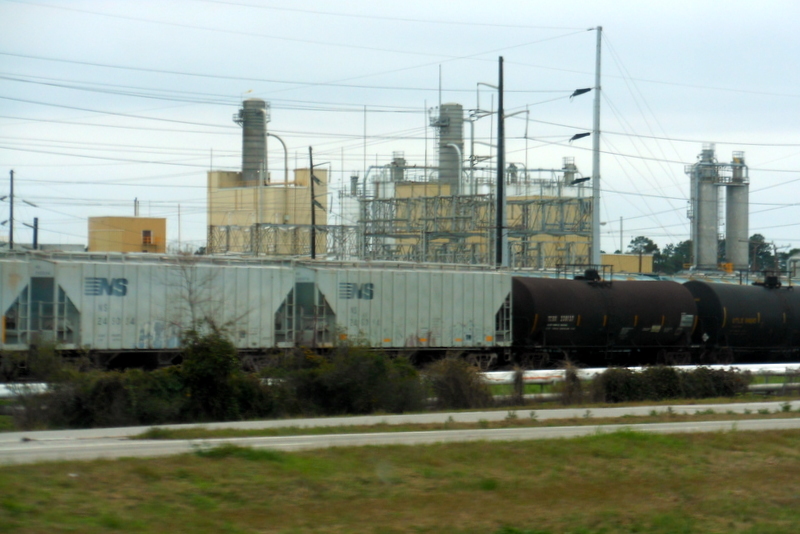 We drove through Gueydan, the duck capital of America and made our way back north to Lake Charles and the oil refineries. We then crossed the state line into Texas. Yes, Texas! We are actually in Texas. What Happened to the Scenery? We actually arrived in Texas earlier than we had originally thought. Because the crazy weather of the last two weeks had caused us to reroute and then delay our trip, we came to the conclusion this past weekend that we would not make it back to Memphis or to Arkansas. I’m sad about that, since I had really wanted to visit there, but we’ll save that part of the country for another time. I know it sounds odd that we “don’t have time” to go somewhere, but we actually have a schedule to keep at the moment. We are meeting Kevin in Austin, Texas, on March 3, and need to finish seeing what we want to see in east Texas and the Hill Country before then. Because, after our weekend in Austin, we have reservations in Big Bend National Park starting on March 7. It’s very odd having a deadline again, since we’re used to doing what we want, when we want, but it will be fun to visit with Kevin again. Tim and I had a great time in New Orleans, but it was time to leave yesterday morning. Thousands more people were starting to arrive for the height of the Mardi Gras festivities, and the crowds and traffic were becoming a nightmare. We had had our fun on Thursday night and didn’t feel the need to experience any more of the madness. Looking back on our decision today, we are even happier that we left, given the mass of severe weather that is hitting the city and forcing the rescheduling and/or rerouting of all the parades. We took the southern route from New Orleans and drove through bayou country and the heart of the Mississippi River Delta. 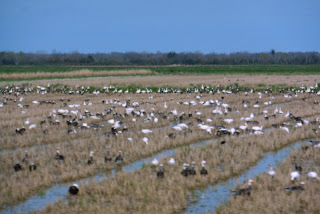 This area is often referred to as Acadiana and contains some of the youngest land in North America. It was settled in the late 1700s by French Acadians, or Cajuns, who were driven from Nova Scotia by the British. The Cajuns were newcomers, a people apart from the French-speaking, native born Creoles, who had lived here since the founding of the Louisiana colony by France in 1699. Both cultures have shaped this region into one like nowhere else in the world. Jean Lafitte National Historical Park and Preserve tells the story of Louisiana’s Mississippi River Delta. It is the most dispersed of all the parks with six sites from Eunice and Lafayette on the west to New Orleans on the east. We stopped at the Wetlands Acadian Cultural Center in Thibodaux, where very helpful rangers explained both the geographic and cultural history of the region. It was there that we learned of the severe weather system that was headed our way. We had planned to camp near New Iberia, but thought a nice hotel in Lafayette would be the best bet. 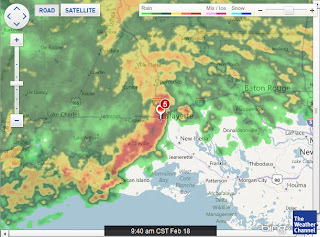 It turned out to be a wise move, as we watched tornado-producing clouds pass outside our window this morning. 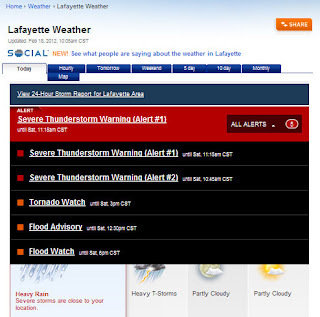 Six severe weather alerts, from possible tornados to severe thunderstorms to imminent flooding were on the board at the same time. Wow! The storms have passed us by, and we’re just fine, but we’re getting a bit weary of having to dodge such severe weather every few weeks. It's Headed Right Toward Us! Wow! 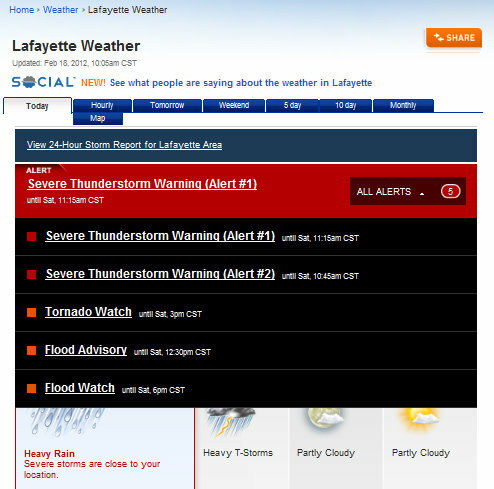 Six Alerts for Us! So as not to keep you in suspense one minute longer, I’m excited to report that Tim and I did everything tonight that we missed out on last night. Hard to believe, but true! We had a wonderful dinner this evening at a restaurant serving authentic Creole and Cajun dishes. We then participated in our first Carnival parade and have quite a collection of beads to show for it. Now, I’ll tell you a little more about how it all unfolded. Our campground in New Orleans is located just a block from St. Louis Cemetery No. 1, and we started our day there. Cemetery tours are especially popular in New Orleans, since cemeteries in New Orleahere ns are unique in that all of the tombs are aboveground. We just decided to wander through on our own. It almost felt like walking through a miniature city, and a spooky one at that, particularly when we happened upon a crypt with offerings laid in front. The tomb of the city’s most famous Voodoo Queen had to be the most-photographed of the bunch. Tim claims we only went to the cemetery because his sister Alice got us started looking for dead people when we were in Kentucky. True or not, I’m just glad we went. One of the prettiest places in New Orleans is St. Charles Avenue and its adjacent neighborhoods, and the best part is that the historic St. Charles Avenue streetcar will take you there. We took the streetcar all the way to Audubon Park and then started walking. We passed by the gated entrance to one of the city’s most exclusive neighborhoods, Audubon Place, with its fabulous historic houses. We walked by Loyola University and wandered into Tulane. Just as Tim asked what Tulane is noted for, he looked at a map and found we were standing in front of the Anthropology Building. Maybe the archeologist in him just knew it was there. Mardi Gras parades in New Orleans travel down St. Charles Avenue, and we saw people already staking out their spots for the parades this evening. Chairs, tarps and ladders lined the avenue. Maybe I just haven’t attended many parades in recent years, but the ladders were a surprise. Some even had a seat attached to the top to make viewing that much more comfortable. We saw evidence everywhere of the beads that had been thrown the night before. I wonder if someone cleans up the ones that end up hanging from trees and power lines. We returned to the French Quarter to attend a jazz concert at the Old U.S. Mint Performance Hall. As it turned out, we probably heard more jazz at several impromptu street performances than we would at the Mint. The New Orleans Jazz National Historical Park sponsors daily concerts, and the one this afternoon was to feature works by some of the rangers. Unfortunately, the main performer was off today, so the lone ranger who showed up mostly gave us a talk on the history of jazz, illustrated by a few bars or songs on the guitar. The park has some very talented rangers on staff, and Tim and I both had such a great time today and yesterday chatting with several of them. We had an early dinner at The Praline Connection, a restaurant off the beaten track that serves authentic Cajun and Creole dishes. Tim and I shared the “Taste of Soul” platter, which was divine. The gumbo, jambalaya, fried chicken, catfish, ribs, red beans and rice, greens, cornbread and bread pudding were delicious. But the best part of the meal was chatting with our server and the large, extended family that arrived shortly after we were seated. The ladies who sat closest to us had arrived in New Orleans for a baptism, and they were such a hoot. The weather had held up for the day, and we wondered whether the predicted thunderstorms would rain on tonight’s Mardi Gras parades. Should we attend? Were we too tired? In the end Tim made the decision that we should just go. We walked over to Canal Street and waited with several hundred other people for over an hour for the parade to arrive. Once the parade began, we had a blast. We discovered that “crowd participation” parades are much more fun than just watching floats go by. As you probably know, float riders in Mardi Gras parades throw scores of beads, cups and other baubles to the crowd. Tim and I found ourselves getting caught up in the action, vying to catch the beads that were being tossed from the floats. Tim even accused me of being too greedy! He was probably right! The parade we watched was put on by the Knights of Babylon. The floats were very traditional in design and have changed little in more than seventy years. The floats were just beautiful, although it was a bit difficult to appreciate their elaborate designs while focusing on catching the throws. Although there were two more parades to come, we decided to call it an evening and returned to the RV with our loot – scores of beads and a cup. We may never make it to Mardi Gras again, but I’m so glad we bit the bullet and enjoyed the party this time.